Today I attended a CFA community meeting at Yarra Glen. Around 600 local residents attended, the crowds so large they spilled out in front of the hall. It was a very emotional meeting. Many people in the local community have lost family, friends, houses, pets, livestock and businesses and to see the pain and devastation was harrowing. Drew, a local volunteer with the CFA, lept spontaneously to the stage and spoke of his experience fighting fires over the last two days. His story was heartfelt and heartbreaking. With tearful eyes and a breaking voice he spoke of saving other peoples homes while watching his own home go up in flames, he spoke about how very stretched the CFA were and how they were doing their utmost to protect people and property. He apologised for not doing more. "Drew, you and all of our volunteer fire fighters are heroes. Words cannot express how thankful we all are for your efforts. " Drew’s key message to community was please be patient, there’s a lot of people working on the ground and it’s the time to pull together as a community to get through this terrible time. 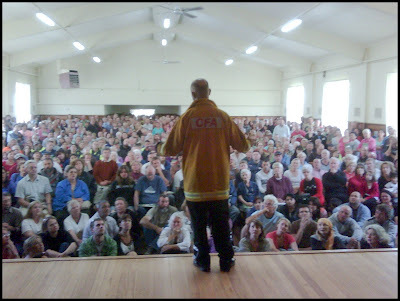 Drew left the stage to a resounding applaud and many pats on the back, the community outwardly showing its respect and thanks for the CFA and its volunteers. In response to the desperate need in the local communities that surround Yarra Glen the Shire have set up and Emergency Relief Centre at the Yarra Glen Memorial Hall that is in operation as of this afternoon. Council support services will be available as well as DHS and RedCross services.